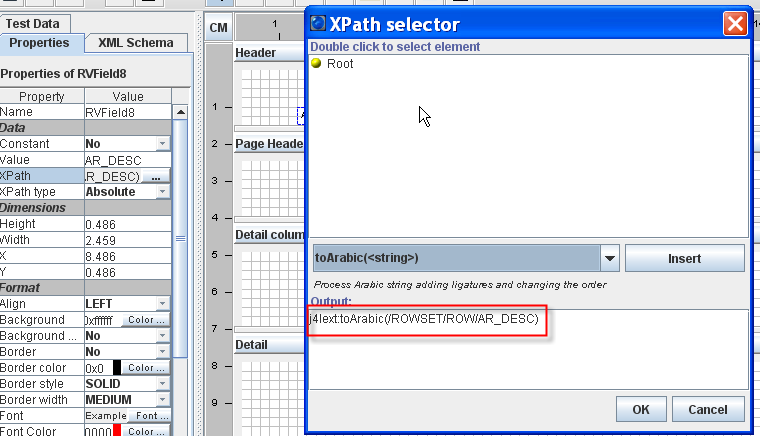 This articles describes how to add arabic text to PDF files using apache FOP and FO Designer 1.5.3 or later. What is special about arabic text is that it does not only requires specific font files but the characters will be shown is different ways (using different font glyphs) depending on the position of the character (you can find more information about ligatures here), so there is no one to one relationship between characters and glyphs as in other languages. Furthermore arabic text will be written from right to left as opposite to most languages that will be written from left to right. In other to include arabic text in the PDF file, the first step is defining the font to be used. In this example we will use the trado.ttf font file which is available in windows 7.
these lines will tell Apache FOP and FO Designer about the new font. If you now execute your report, the PDF file will contain the correct text.